This book is the story of a journey to Mount Kailash under the guidance of the Tibetan Dzogchen master Chögyal Namkhai Norbu. It also recounts the history of the adventures that led to the discovery of the ancient capital of the forgotten kingdom of Shang Shung. Above all, it is the account of a spiritual pilgrimage: as all pilgrims believe, the path will take them on an inner voyage of transformation from which they will return a changed person. Even when faced with obstacles, hardship, or unforeseen circumstances, there is no turning back. 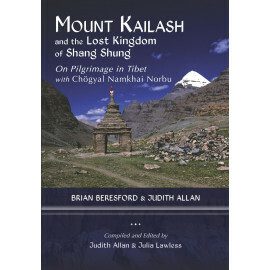 Based on accurately archived notes of Brian Beresford, a professional photographer and filmmaker, the book contains the records of his many meetings, conversations, and interviews with Chögyal Namkhai Norbu regarding the history and significance of Shang Shung, providing rare and firsthand insight into Tibetan culture, as well as making for lively reading.